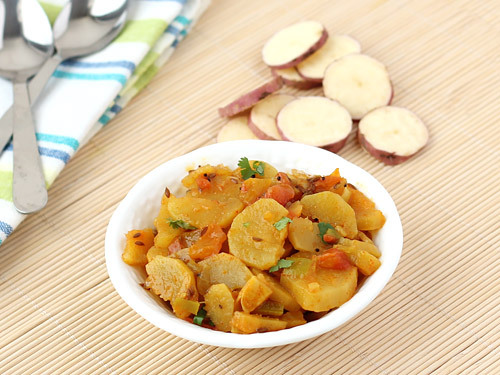 Healthy sweet potatoes make as tasty and delicious curries as normal potatoes do. 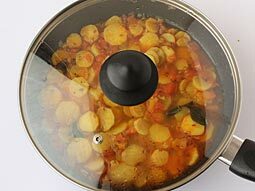 Learn how to make Indian style curry of sweet potatoes by following this easy and simple recipe. Peel and cut sweet potatoes into slices. 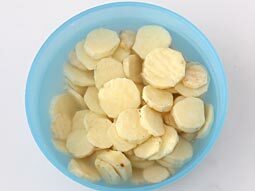 Keep them into water to remove excess starch and prevent from turning dark in color. 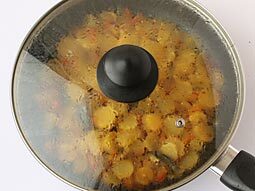 Heat oil in a non-stick pan or kadai. 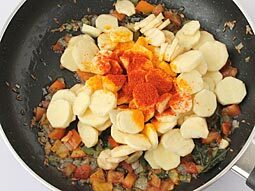 Add mustard seeds; when they begin to splutter, add cumin seeds and curry leaves. Sauté them for few seconds. 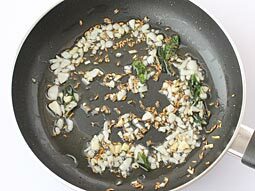 Add chopped onions and garlic, stir-fry until onion becomes translucent. 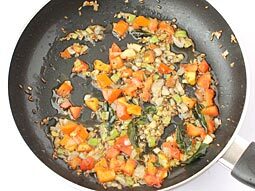 Add green chillies and chopped tomatoes, cook over medium heat for 2-3 minutes. Add sweet potatoes, turmeric powder, red chilli powder and salt. Mix them and sauté for 2-3 minutes over medium flame. Add 3/4 cup water and bring it to boil. Cover with lid and reduce flame to low. Cook covered until sweet potatoes become soft and gravy turns thick or for around 8-10 minutes. Stir in between occasionally to prevent sticking and add more water if required. Turn off the heat and let curry stand for 5 minutes. 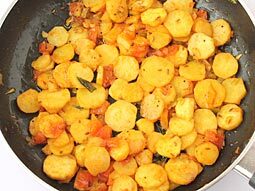 You can also use boiled or steamed sweet potatoes instead of using raw one. If you are using boiled one, then decrease water quantity to 1/4 cup in step-5. 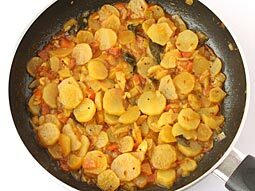 Add 2 tablespoons grated coconut in step-6 just before turning off the heat and mix well to make sweet potato curry with coconut. 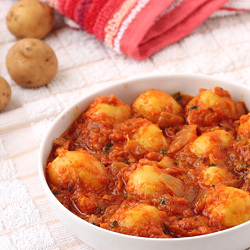 Serving Ideas: Serve it with steamed rice or chapati. Many of the recipes I read and tried are very good. Many steps in the recipes I was not sure of became clear and now I have the confidence to go ahead and try them. Thanks a lot.